This story, more elaborate than what I share here, continued on with much laughter and more questions. All eyes and ears were on the speaker. There was not one smartphone sitting on the table. They concluded their evening with a round of hugs and making informal plans for their next chance to meet. “That story is so good, I bet someone would pay you to tell it!” remarked one of the friends. “We’ll have to just keep on talking over the phone until we can meet again,” lamented another. At restaurant, noticing five seniors discussing their daily lives. They listen with intent, no phone in sight. Master conversationalists. This observation of a conversation could be described as normal. Except it is not. What seems to be normal now is a family or a group at a restaurant or the kitchen table, with a fork in one hand and a mobile device in the other. Conversations can never run deep if people’s attentions are divided between who they are with and who they are not. 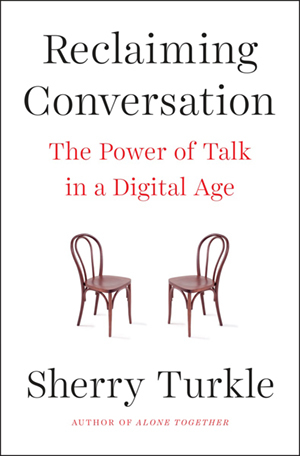 This is the topic of the new book Reclaiming Conversation: The Power of Talk in a Digital Age by Sherry Turkle (Penguin, 2015). Her previous contributions, such as Life on a Screen and Alone Together, identified both the benefits and the drawbacks of our connections online. In her newest entry, Turkle tackles the challenges of always being “on” and offers advice for making ourselves more present for those most important to us. The last sentence should really give us pause (it did for me). Technology’s pull is influencing how we act as people and social beings. We thrive on connections, yet have a hard time prioritizing the most important ones. I’m as guilty as anyone. I’ll check my social media notifications a dozen times a day, even while I am writing. It gets to the point where I actually turn off the wireless while writing, or leaving my smartphone at home when running errands. This isn’t happening strictly in public/social settings. Schools are also experiencing a sense of dividedness regarding attention. Students’ smartphones being confiscated because they went off during class is almost becoming a rite of passage. I can attest: As a former assistant principal, I had one drawer in my desk designated for holding these devices until parents came to school to pick them up. Teachers often see smartphones as distractions, and not always because they are “trying to teach”. So why does this fairly new phenomena occur? One reason is when someone receives a notification or a message on their phone, it triggers the reward center in their brains. That’s why people leave their phones out in sight. However, as Turkle notes, studies show that the mere presence of a phone on the table changes what people talk about (21). Others worry that their conversations might get interrupted, so they keep discussions at the surface level. Also, dealing with people means giving up control of the conversation and what we might want to say. “Human relationships are rich, messy, and demanding” (21). As I read on in Reclaiming Conversation, I hope to gain new knowledge in how to navigate my own connected life a little better, as well as to guide my kids and those that I learn with regularly. By the way, no one has it figured out. Not even the five seniors at the restaurant. As they were leaving, one of them wanted to show her friends a funny commercial she watched on television. She pulled out her smartphone while standing at the front doors of the restaurant, opened YouTube, and played the commercial on her screen with two friends – while others were seated at tables. We all have something to learn. I added Reclaiming Conversations to my Amazon cart just now. I am learning how to balance my connected life, too. We are all in the same boat Dana. Hope you enjoy it! When I am catching up with family or friends I put my phone or my iPad away and enjoy the conversation. But sometimes I want to share something I have seen or information I have found out and doing so using technology is interesting and efficient, so will get out my device to do so. On the other hand, when I am out with my husband, with whom ongoing conversation is plentiful, we may each refer to our device for notifications or games. It doesn’t detract from our depth of conversation at other times, in fact what we see or do on our devices may add to it. I look forward to finding out what further inspiration you get from Turkle.